Blake Comeau sent a pass through the crease that bounced off the boards in the left corner to Esa Lindell, who let a shot go from the left point that beat Connor Hellebuyck over the blocker and in. Ben Bishop sent a pass to Mattias Janmark at the Jets blueline. He fed a streaking Radek Faksa behind the Jets defence in the slot where Faksa snapped a shot just inside the right post and in. While on a 5-on-3 power play, Alexander Radulov flipped a pass across to Tyler Seguin at the left face-off dot. Seguin snapped a shot over the blocker of Connor Hellebuyck and in. 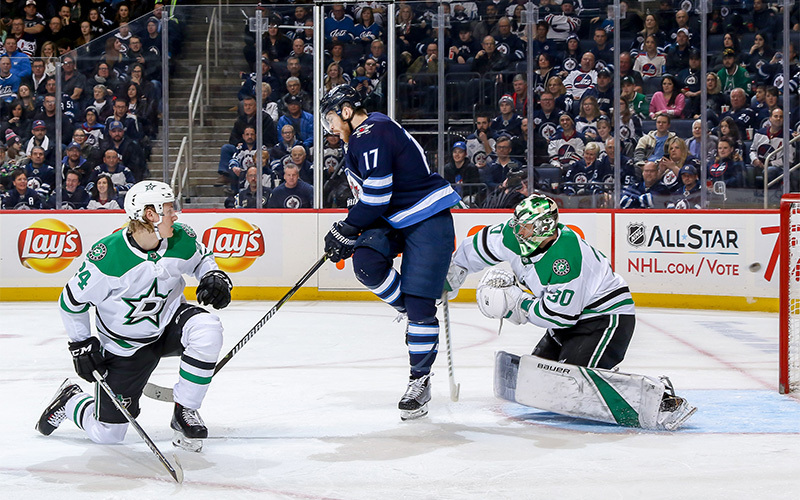 Tyler Myers sent a backhand pass across the ice that was picked off by Miro Heiskanen, who carried it into the slot before sliding a backhand pass to Tyler Seguin at the left of the crease. Seguin lifted the puck over Hellebuyck and in. Kevin Hayes took the puck at the red line and broke in 2-on-1 with Kyle Connor. Hayes out-waited a sliding Ben Lovejoy before sending a backhand pass across to Connor, who fired it behind Ben Bishop and in. While on the power play, Jacob Trouba fed Patrik Laine at the right face-off dot and he one-timed a slap shot just inside the far post. With the Jets net empty, Valeri Nichushkin took a shot that was blocked, but the rebound bounced to Radek Faksa, who knocked it into the empty net. Winnipeg falls to 1-1-0 on their current four-game homestand. Falls to 45-27-4 overall and 25-10-4 at Bell MTS Place. Went 1-for-2 on the power play and are 7-for-23 (30.4%) in the past 8 games against the Stars. Fall to 6-22-0 this season when trailing after the second period. Registered his 30th assist of the season. It’s the first time Connor has surpassed 30 assists in a season. Has 10 points in his past five games (6G, 4A), including four multi-point games. Led the Jets with five shots tonight. Won 16-of-24 face-offs tonight, one shy of his season-high of 17. It’s the third time this season Scheifele has won 16-or-more face-offs in a game. Led the Jets with eight hits tonight. It’s the fourth time this season Tanev has registered 8-or-more hits in a game. His season-high is 10. Led the Jets in ice time tonight with 26:37. Scored his 30th goal of the season tonight. Laine has reached the 30-goal mark in each of his three seasons in the NHL. Started his 200th career game tonight. Lost for the first time in his past five games, and falls to 32-21-2 on the season. Assisted on Kyle Connor’s third period goal and now has five points (1G, 4A) in his past two games.